My creative friend in Australia, Licia Politis, introduced me to Up the Wooden Hills, a pretty site owned by Lisa Marie Andersson in Gothenburg, Sweden. 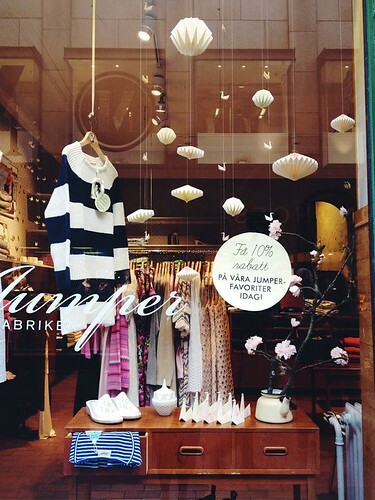 Originally a designer of handmade clothing, Lisa Marie also enjoys creating origami ornaments and so began to sell them alongside dresses in her online shop. Not surprisingly, the decorations became an instant hit. Last summer she put the clothing line on hiatus and now offers paper items exclusively. Lisa Marie designs and prints a selection of patterned origami papers and folds each decoration herself, all from a one room home studio. 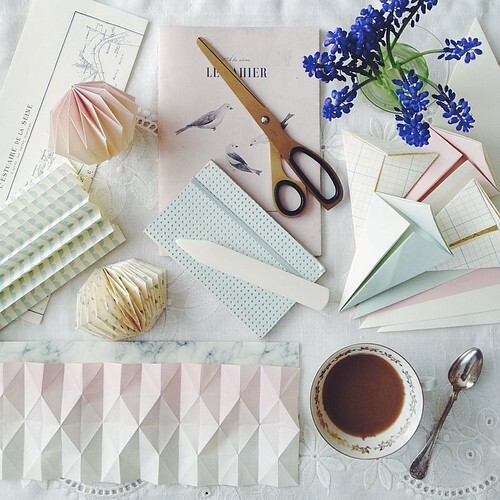 The cohesive range of items, mostly feminine color palette, and her styling sensibilities have caught the attention of store decorators and magazine stylists, leading many to source her paper objects for use in their displays. 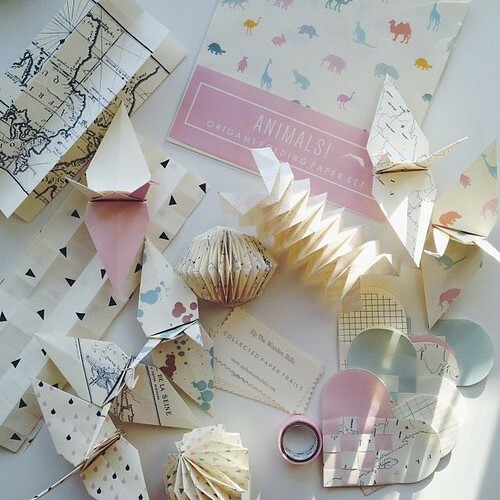 The sun-washed pastel papers seem especially suited to spring and summer. Lisa Marie explains that the designs were inspired by childhood summers at the beach, ice cream, sunshades, old amusement parks, and more. There are three paper sets available at the moment - Color Splash, Geometrics, and Animals - with more on the way soon. 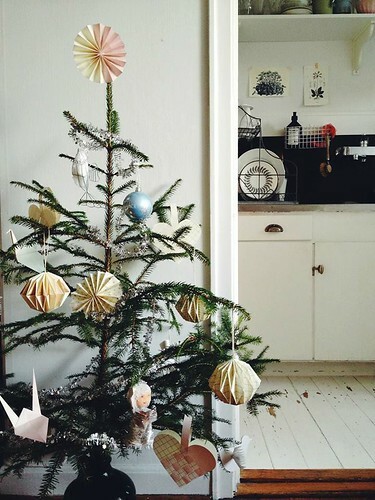 Of course a Christmas tree decorated in the subtly shaded ornaments is beautiful too. It could even stay in place long after the holiday to cheer dark winter days. Lisa Marie blogs occasionally and it was there that I found myself nodding along in agreement with an inspiring post she wrote about the importance of female creative professionals supporting one another, which is something I've been thinking about a lot lately. That someone else is experiencing success or victory doesn't mean that your own chance of experiencing it or running a successful business, etc, is reduced. Success is unlimited. I can say from experience that being completely on your own does not make you strong. Actually the opposite is the case: we are all stronger together. 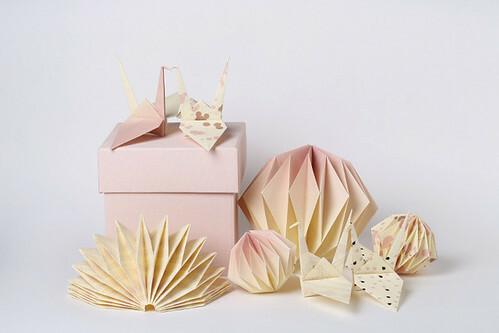 Lisa Marie is working on new origami shapes that will launch in the shop this summer. 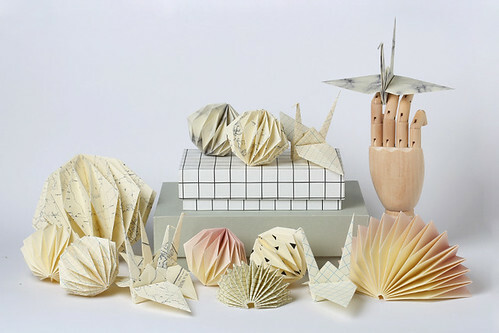 She leads origami workshops at design stores in Sweden - the next class will be held at Kvart Interiör in Gothenburg on June 5 - and her work will be included in a paper art exhibition at Frövifors Pappersbruksmuseum in Frövi, Sweden that opens on the 31st of May. Up the Wooden Hills is on Facebook and Instagram. Love the tree. Wonderful work. 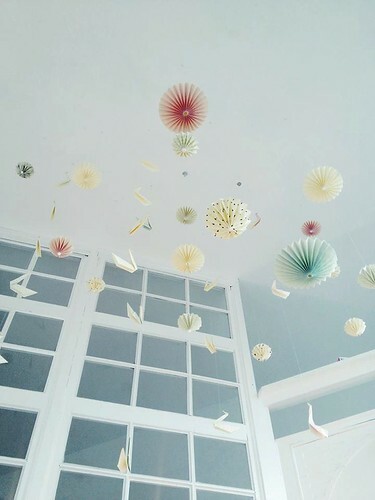 beautiful origami, thank you for sharing! Beautiful ornaments so perfectly folded.